Last fall I did a Calgary Donair Quest, even though it is really Edmonton that is known for the notorious prairie donair. 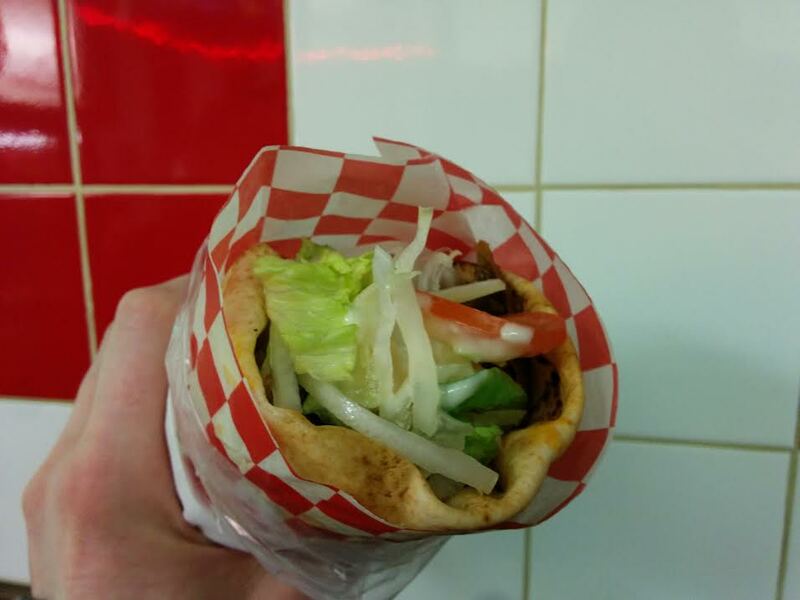 Its history dates back to the 1980s which you can read about in this Walrus article: The Donair Wars. Donairs are usually sold alongside hamburgers and/or pizza. Some shops also offer Persian or Middle Eastern fare. Generally there is an ordering system where you are given a number and wait for your order to be called. It is common for donairs to be served as a combo with fries and a pop. Athena and Aladdin are the big suppliers of donair cones in Edmonton, though some shops make their donair meat in-house. We found the meat to be nice and spicy, with varying denseness/softness. Chicken Donair is fairly universal in Edmonton. Rather than being a chicken meatloaf, it resembles shawarma. Chicken/Beef Mix donairs are a thing. 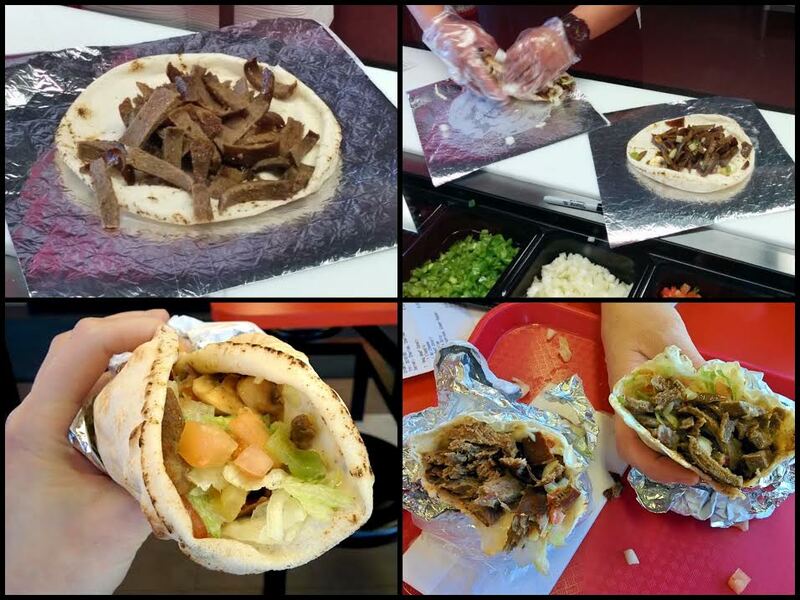 The Edmonton donair is customizable, like the Calgary donair with its various pickles and sauces. This differs from the Halifax donair, which does not involve lettuce. Cheese is also a popular topping. Most menus feature a “Cheese Donair”. It is not uncommon to see sauteed peppers or mushrooms offered as toppings. The sauce was generally on par with what you’ll find in Halifax. Pitas were generally steamed (rather than grilled) and tightly wrapped (not stuffed). The Edmonton donair is neat and tidy compared to a Halifax donair. You would never think to eat these open-faced. I ordered beef donairs Edmonton-style with tomatoes, onions, lettuce and sweet sauce. These were split with my my Calgary companion, LuShark, who gave her two-cents. Her palate is one that I admire and trust. At PrimeTime you can get a Classic Donair or a PrimeTime Donair. The latter has donair meat that is grilled with sauteed onions, peppers, mushrooms and your choice of sauce: Bold BBQ, Sweet & Spicy, Honey Garlic, Butter Chicken, Spicy Fire, or Pineapple Curry. I have to admit, the idea of cooking my donair meat in weird sauces was off-putting. But the idea of a donair-Philly cheesesteak fusion was intriguing. So we ordered a PrimeTime Donair with the best-selling Sweet & Spicy sauce, as well as a Classic Donair. We really enjoyed these! The meat was sliced in thick strips, but it had a favourable taste and texture. The PrimeTime donair was a nice change from the regular recipe. It accommodates people who like to change things up, or who don’t like the traditional donair flavours. We were impressed with Edmonton so far! Swiss Donair resembled a polished fast food restaurant with its numbered combos and pictures above the ordering counter. Combo #1 is a regular donair with fries and a pop for $11. I was impressed by how clean and efficient everything was. The guy at the counter said, “tomatoes, onions, lettuce, sweet sauce – right?” I was pleased to see that there was a standard preparation. 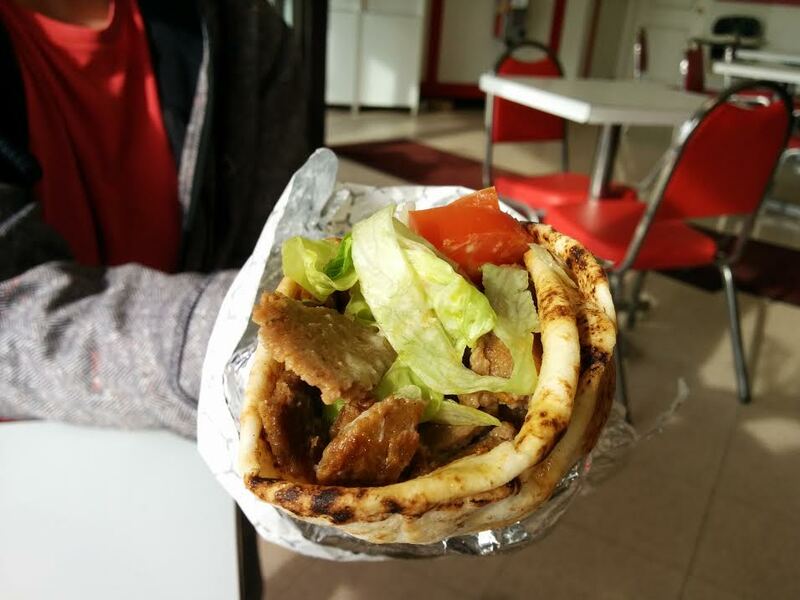 As for the donair – I knew as soon as my lips graced the pita that it was perfection. I made exclamatory noises as I chewed my first bite (much to LuShark’s amusement). This tasted like Halifax! The meat was shaved just right, with some crispy bits. The sauce was the exact consistency that I like – not too gooey and not too thin. The flavour was on point. These donairs were wrapped expertly tight – in true Edmonton fashion. I was in love! Top Donair is virtually next door to Swiss Donair, located in the same strip mall. Unlike Swiss Donair, this shop was not bustling with staff and patrons. Alongside donairs were burgers, pizza, Lebanese and Afghan food. There were also baked goods. LuShark ordered a cannoli! After our experiences at PrimeTime and Swiss, we weren’t as easy to impress. This donair was better than anything I’d had in Calgary but we were underwhelmed by the custardy sauce and the meat that was sliced too-thinly. However – I have heard reports from people who have had opposite experiences at Swiss/Top. I think either shop at any given moment could get you a solid donair. Queen Donair has several locations across the city but we decided to go for the ‘ol late night Whyte Avenue run. This almost reminded me of grabbing a donair at pizza corner in Halifax. This was a pretty small shop, with just a counter and a couple of stools. Pizza slices, burgers, subs and poutine were also offered. 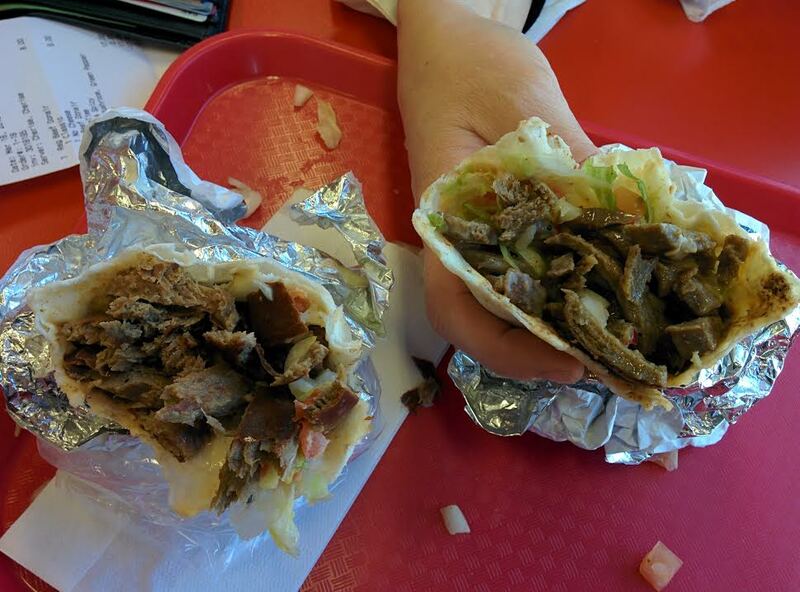 There was nothing particularly wrong with this donair, except for the lettuce to meat ratio. There were too many cold crunchy vegetables and not enough meat. Mike’s Famous is also located on Whyte Ave (it used to be a Marco’s Famous). 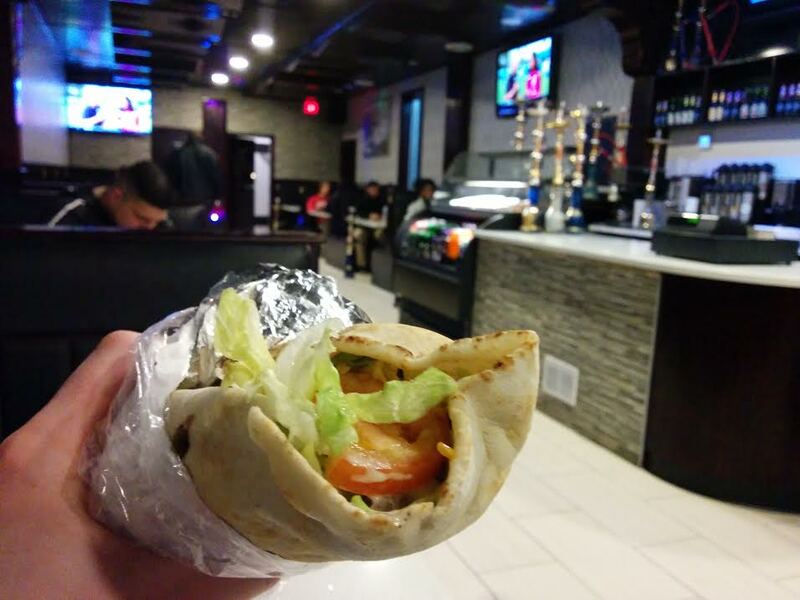 It serves as a hookah bar that sells donairs, burgers, and (I think) some Middle Eastern food. The donairs here automatically come with cheese so that’s how we got ’em. We took a couple bites and put our donairs down. Yuck. The meat was like spongy sawdust blended with a paste of mechanically separated animals. It was an affront to our palates. We had to go grab beers at a bar to get the taste out of our mouths. This was our first experience with the Aladdin brand of donair cones. What a difference! 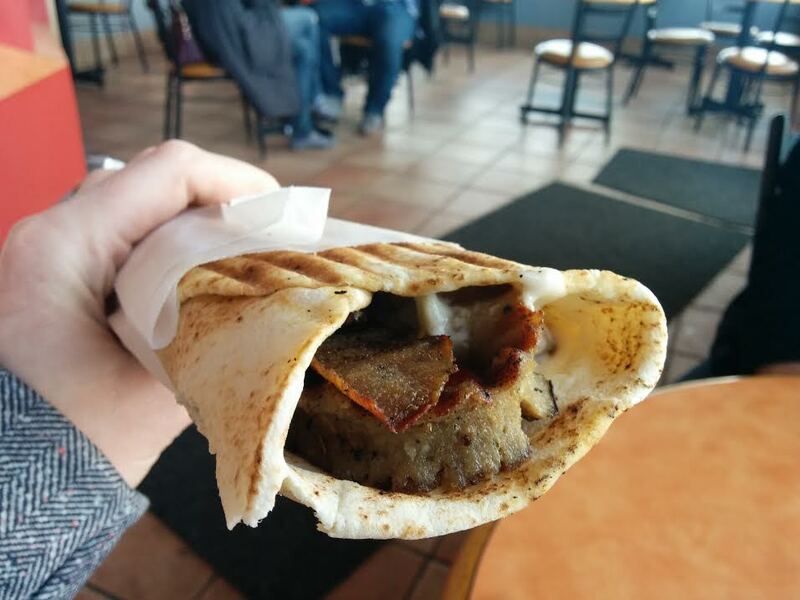 I had been hearing lots of claims that this unconventional donair is the best in Edmonton. The pitas here are grilled post-assembly, with a coarse sea salty seasoning on the outside. Stylistically, this is what differentiates High Voltage from other donair/sandwich shops. 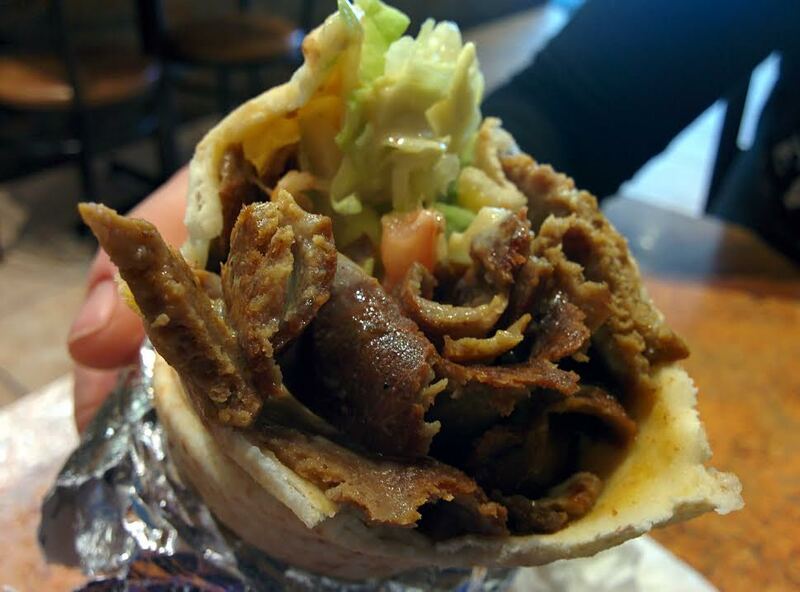 They serve both Gyros and Donairs, with wacky varieties like Caribbean Jerk and Blue Cheese. Then, of course, we have the “East Coast Donair”. The meat was fine, though it didn’t really stand out. I liked the grilled and salty pita. The sauce, tho. They put vanilla in it. Vanilla!? We agreed that the salty, meaty, bready, too-sweet combination reminded us of the carnival. This didn’t taste anything like an East Coast Donair. I was eating corn dogs and cotton candy! My verdict? I’ll bet the gyros are great here. Simon King has been around 30 years, pre-dating the existence of mass produced loafs. For this reason, they were the only shop on my quest that makes their donair cones in-house. I’m told they use 17 herbs and spices. The meat was definitely spicy, but softer than Athena’s meat. There was a generous helping of it, tightly wrapped in a pita with some decent sauce. This donair falls somewhere in the middle of the pack. I want to like it more, but I think I’m partial to Athena’s donair meat. I thought the lettuce would get stupid soggy, but it actually offered a refreshing crunch to counterbalance the spice, grease and sweet. It would be totally out of place on a Halifax donair, but somehow it seems to work okay on the tightly-wrapped Edmonton variety. 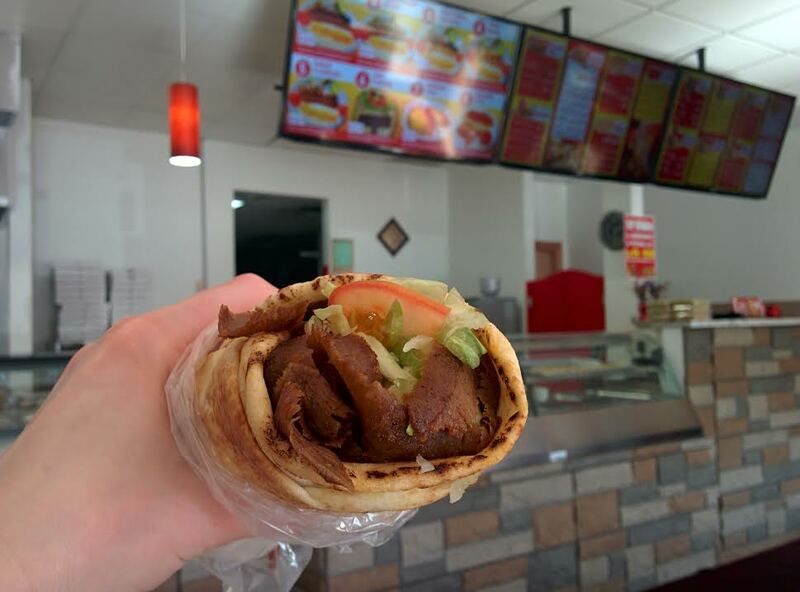 I think the Edmonton donair is distinct enough and has enough cultural homogeneity to be honoured with its own classification in the Doner Kingdom: Family: Gyro, Genus: Donair, Species: Edmonton Prairie Donair. Do I think it’s on par with the Halifax donair? Well, no. 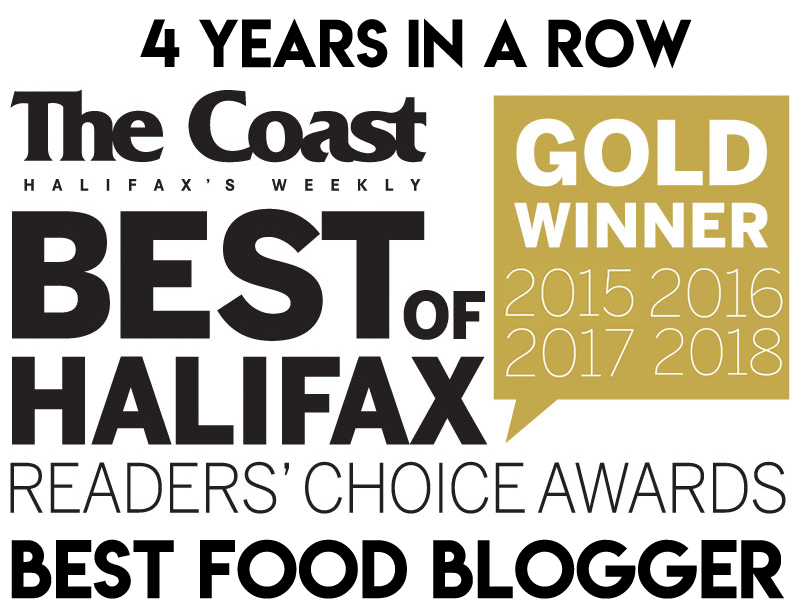 And aside from personal biases (lettuce vs no lettuce, big ‘n’ sloppy vs neat & tidy) the huge spectrum of quality is something I haven’t personally experienced in Halifax. In Edmonton you can find really good and really bad donairs, but the good ones are pretty darn good! 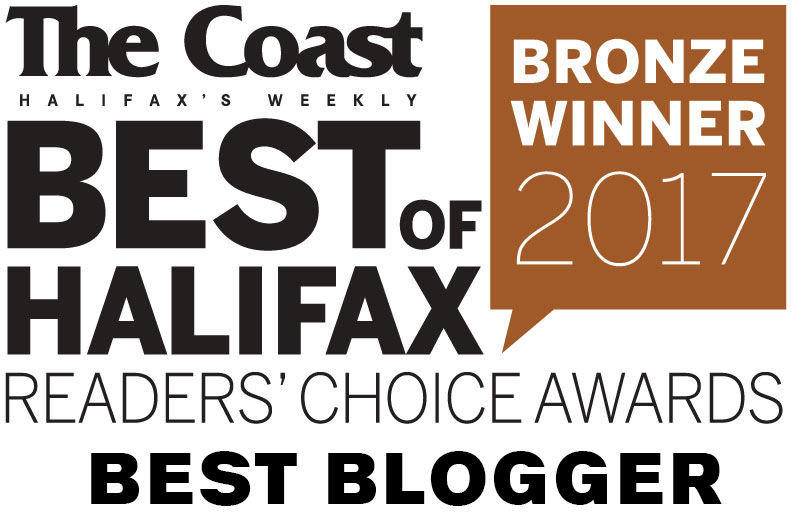 You need to redo this list, but also travel to Spruce Grove where there’s the BEST donair. Try J’s Diner. I haven’t had donair better.